These fun Llama Drama quote graphics are perfect for decorating your classroom, organizing your resources, or creating products to sell on TpT! 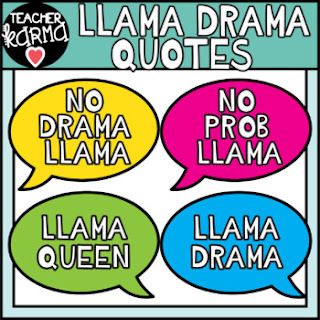 Love these speech bubble quotes? Click here to check out the Llamas!! You'll also receive the blank quote / speech bubbles to create your own! There are 8 great graphics included in this download. Each png graphic was created at 300 dpi. You will receive both color and blackline clipart.